Scotland's fingerprinting agency has become a worldwide embarrassment, according to an expert. Forensic scientist Allan Bayle was speaking before the launch of a new website supporting the former police officer, Shirley McKie. She is suing the Scottish Executive and the Scottish Criminal Records Office after being wrongly accused of leaving her fingerprint at a murder scene. Ms McKie and her father have campaigned for reform of the fingerprint system. She was cleared of lying on oath in 1999 after insisting that a fingerprint found at the scene of the murder of a Kilmarnock woman was not hers. She has now launched an action for damages against Scottish ministers, who are responsible for the Scottish Criminal Records Office, which was found to have bungled the fingerprint evidence against her. On Monday, Mr Bayle demonstrated analysis techniques which he said made the mistakes obvious. The new technology from LumenIQ, which is not yet in use in the UK, allows sophisticated analysis of a suspect's fingerprint compared with scenes of crime evidence. He told BBC Radio's Good Morning Scotland programme: "There's parts of the mark (fingerprint) you can actually do the comparison yourselves without being an expert and it just shows quite blatantly that the SCRO are not telling the truth. "They've had all these inquiries but they still haven't changed, they've got a long way to go, they're still making mistakes and that's alarming. "I'm getting phone calls from all over the world from experts saying they're being asked about the McKie case." 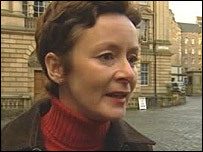 Ms McKie said: "I hope that the Minister for Justice Cathy Jamieson, the Lord Advocate Colin Boyd, Strathclyde's Chief Constable Willie Rae and others in the Scottish justice establishment, when faced with the evidence of their own eyes, will now admit that the SCRO experts have pulled the wool over their eyes and that they will after eight long years let me get on with my life." After being cleared of perjury, Ms McKie sued her employer for malicious prosecution, but lost her case in February 2002 and was hit with a legal bill from Strathclyde Police lawyers. Ms McKie, of Troon, Ayrshire, who is on medication for depression after facing bankruptcy, was said to be "absolutely overjoyed" when an anonymous donor paid the £13,000 legal bill in June this year. Her father, Iain McKie, a retired police officer, supporters Mike Russell MSP and Alex Neil MSP, as well as a human rights lawyer attended the briefing in Craigie Hall, Dumbreck. A Scottish Executive spokesman said: "Due to ongoing legal proceedings we are unable to comment on this issue." Strathclyde Police also refused to comment.